Verticals is an exhibition of works by American artist Cory Arcangel with a focus on his new series of 14 Scanner Paintings. These new works are shown together with a number of drawings, a laser animation, two video sculptures referring to Nam June Paik’s TV Buddha and a new minimalist sound installation. A pioneer of technology-based art, Arcangel works in a wide variety of media, including music composition, video, modified video games, performance, and the Internet. The ease with which he recognises how to use software, hardware and Internet resources as raw artistic material, placing them in new contexts, reveals a new kind of style. The ageing process of technologies is always a central question in his oeuvre. The Scanner Paintings, a series conceived since 2010, are based on commercially available textiles, which are scanned, inscribed with the artist’s signature and printed with UV ink on IKEA LINNMON table-tops. They show various types of leggings – sweatpants, track pants, Daisy Dukes and ripped denims. 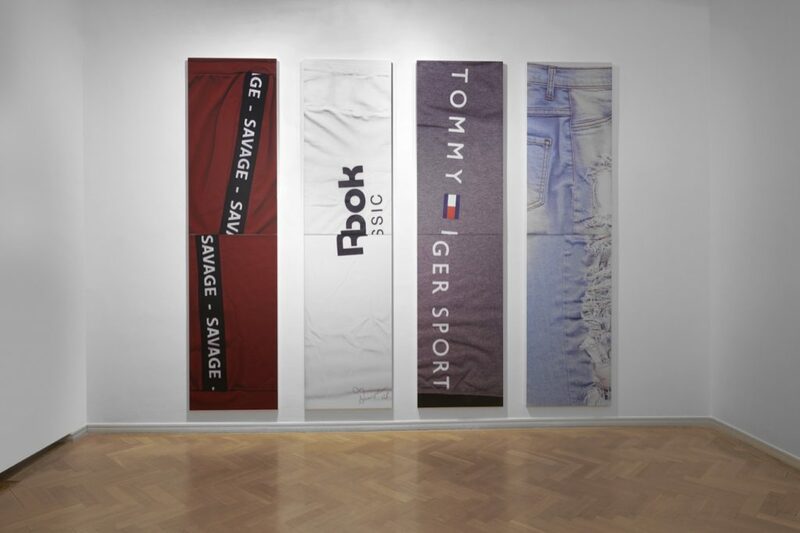 In each work, details such as waistband, pockets, zips, and logos are combined, usually collage-like, on two boards hanging one above the other. Overlapping letters create word-plays and new meanings, or the logo is legible only by force of the branding typography. 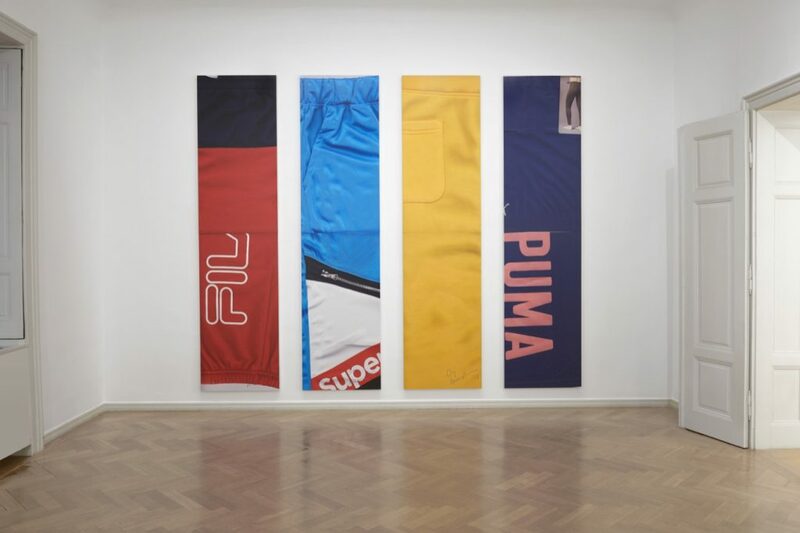 Independently of changing fashions, the sports labels are part of a contemporary pop culture and a collective memory to which the artist refers. Arcangel’s almost abstract laser animation Dunk takes the form of a stylised basketball player from an NBA video game throwing a ball into the basket. The artist drew the animation by hand into a computer using a Wacom tablet. It is projected onto the wall using a Kvant Laser Clubmax 800. Arcangel sees the Slam Dunk as a typically American phenomenon that illustrates America’s current role in the world – requiring only brute height and strength, rather than ball-handling skills or finesse. The Original and Season 6 are videos made in real-time with the aid of baby monitors. In the first of the two video sculptures, the digital video baby monitor is directed at a plastic mannequin’s head wearing a structured man’s hat from Ping Men’s Tour and OakleyMen’s OO9154 Half Jacket XL 2.0 golf sunglasses. The other baby monitor is directed at a Yeezy Season 6 crepe slide slipper on an acrylic display stand. The displays echo Nam June Paik’s legendary TV Buddha(1974), in reverse: the object is being observed, and baby monitors are surveillance devices. Arcangel’s First Solo Exhibition in 3 Years and Most Comprehensive Presentation of his Scanner Paintings to Date1. Cory Arcangel was born in Buffalo (NY) in 1978. After living in New York for 15 years, he moved to Stavanger, Norway, in 2018, but he still has a studio in Brooklyn. His unique artistic approach is based on his training in classical guitar and his studies in music technology at the Oberlin Conservatory of Music in Ohio in the late 1990s, which coincided with the beginning of the digital revolution and inspired him to become an artist, composer, programmer and entrepreneur. In 2014, he founded a software and merchandise company under the imprint Arcangel Surfware, stocking T-shirts, sweatpants, bed-sheets and iPhone cases – things needed for surfing the Internet. His first flagship store opened in Stavanger in September 2018. Arcangel is the youngest artist since Bruce Nauman to hold a solo exhibition (2011) at the Whitney Museum of American Art, New York. The exhibition Asymmetrical Response, in collaboration with Olia Lialina, toured in 2016/2017 through the art spaces Western Front, Vancouver, to The Kitchen, New York, and Art Projects, Ibiza. 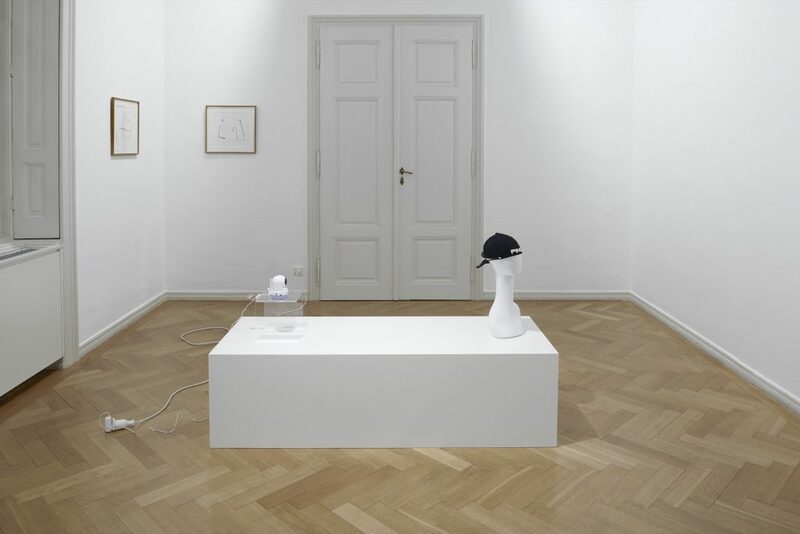 Solo exhibitions have been held in distinguished international museums and institutions, including the Galleria d’Arte Moderna e Contemporanea, Bergamo, Italy (2015), Reykjavik Art Museum, Iceland (2015), Herning Museum of Contemporary Art, Denmark (2014), Fondation DHC/ART Montreal, Canada (2013), Carnegie Museum of Art, Pittsburgh, USA (2012), Barbican Art Gallery, London, UK (2011), Nationalgalerie im Hamburger Bahnhof, Berlin, Germany (2010) and Museum of Contemporary Art, Miami, USA (2010).